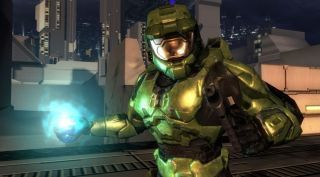 Showtime has confirmed that its upcoming Halo TV adaption will see Master Chief in the leading role and will explore an entirely original story. During Showtime's panel at the Television Critics Association press tour, president David Nevins and president of programming Gary Levine confirmed to GameSpot that Master Chief will feature in the upcoming series. Better yet, he will be the lead character. As the show isn't going into production until next year, there's no word on who will be playing the iconic Spartan or if the series will feature fan favourite AI Cortana. But we do know the series will not be an adaption of previous Halo stories, instead focusing on an entirely original story from a writer with little sci-fi credentials. Showtime announced earlier this year it would be adapting the Halo franchise into a live-action television series, with the first season consisting of 10 episodes. But don't get too excited, it doesn't look like the show will hit our screens until at least 2020. It's an exciting time for Halo fans as Halo Infinite (the latest addition to the iconic video game franchise) was announced at E3 2018. Unfortunately it doesn't have an official release date either, but it's likely we'll see Showtime and Microsoft working together to ensure the game and show come out around the same time.